Even more than Providence, Newport is Rhode Island’s most iconic destination. But, that means it’s easy for visitors to fall into the tired trap of walking the same well-worn tourist attractions as everyone else. Break free, dear vagabonds! I’ve long had a fascination with seeing new destinations from the highest vantage point possible. Skyscrapers, helicopter rides, tall bridges — whatever. 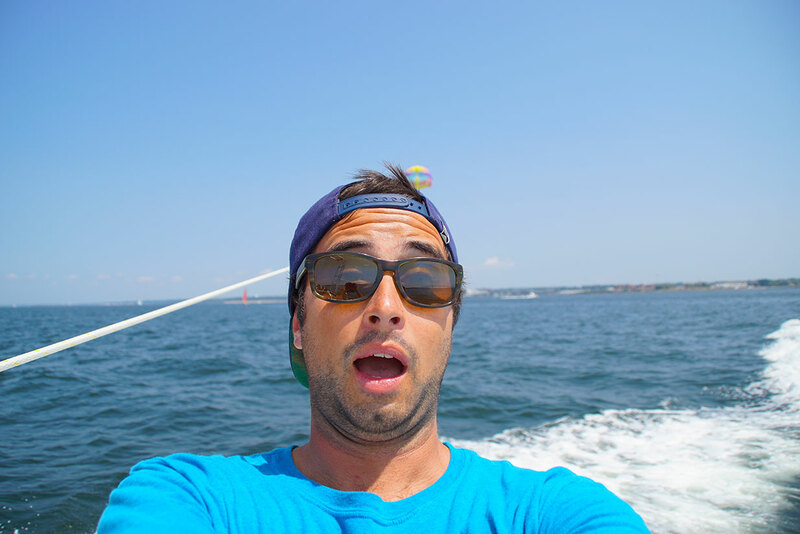 So, parasailing has always seemed like one of the best ways to experience Newport. It took a little prodding to convince Kelsey to go tandem with me. But, she’s committed to trying one new experience every year that scares her. 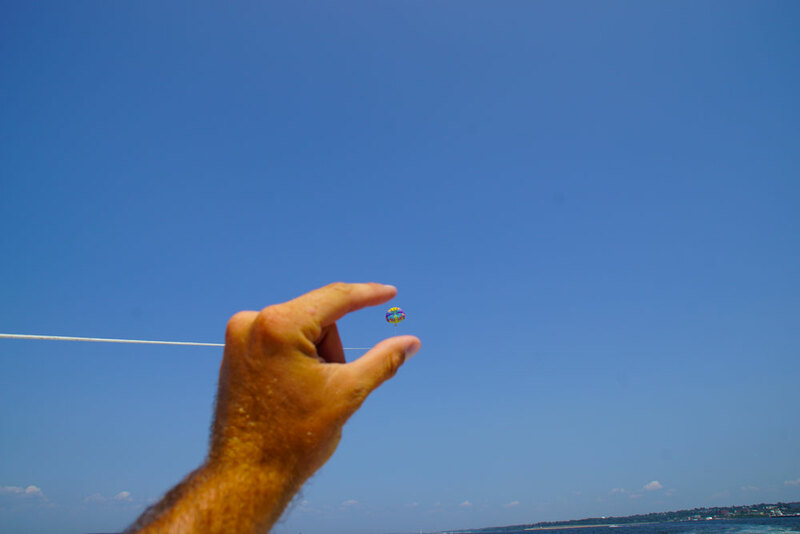 So — up we went with Island Style Parasail. 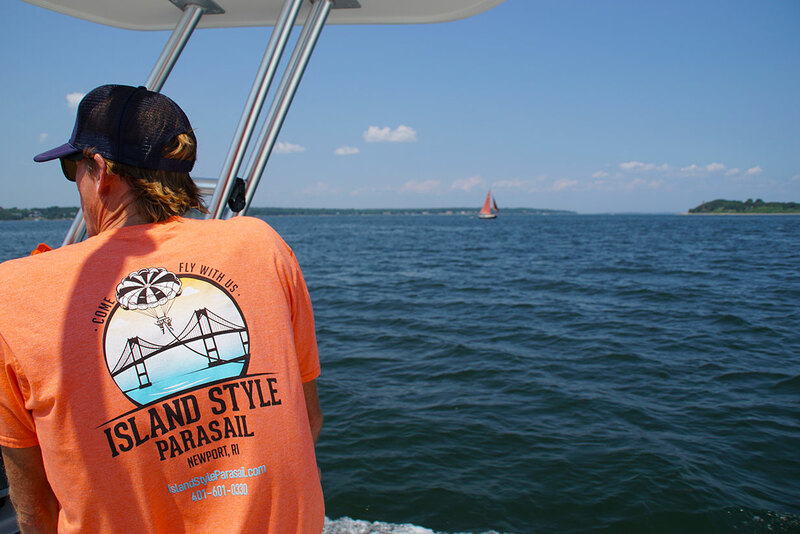 To our surprise, the company is the only parasailing provider in all of Newport. No matter though because Kevin and Andrew (the company’s founder and ride facilitator, respectively) probably wouldn’t have any competition anyway. They’re two guys from Hawaii who seriously love what they do, and I’m convinced they could get a boat full of people excited about watching seaweed float around Newport Harbor. If you’re going to do it, you might as well do it all the way! Our tandem ride with them was even more awesome then we expected! They offer three experience “tiers” depending on how high you want to go: a 600-foot line, 800-foot line, and 1,000-foot line. But, if you’re going to do it, you might as well do it all the way. So, we opted for the “top floor” 1,000-foot experience which allowed us to sail roughly 500 feet over the bay. That’s higher than the support structures of the Newport Bridge! The views are, not surprisingly, fantastic. From the height of a 50-story building, we could practically see the entire state plus some of Massachusetts and Connecticut to boot. Once you get to the top, it’s pure bliss. It’s quiet, relaxing, exhilarating and just plain beautiful. 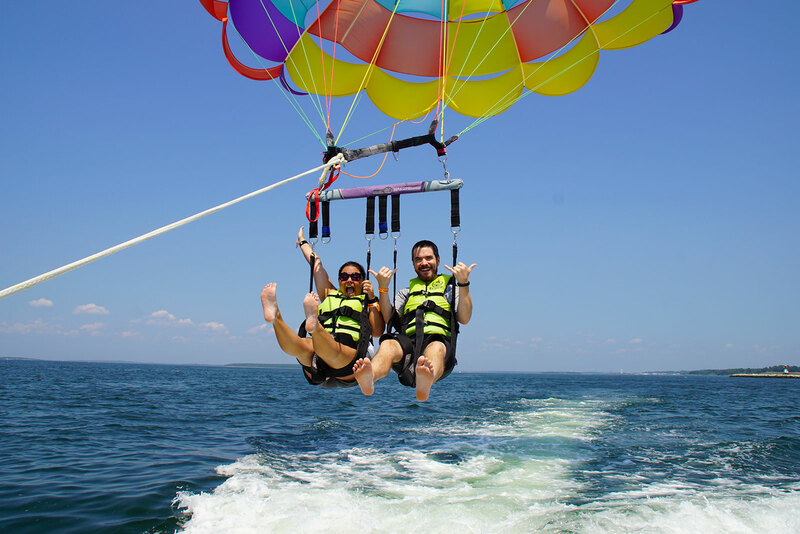 Island Style Parasail only operates during the short summer season, and slots fill up fast. Trips leave every 90 minutes between 9 am and 6 pm daily. 1,000-foot flights are $99 per person (plus gratuity if you’re a good person), but you can score a $20 discount on the first and last flight of every day. Rail Biking is all the rage right now. To be fair, this isn’t an “awesomely adventurous” experience in the sense that it’s a seat-of-your-pants thrill ride. But, Rhode Island’s own rail biking experience with Rail Explorers is a new and interesting way to see some lesser-visited parts of the state. If you’re unfamiliar, rail biking recalls the days of 19th-century rail workers who relied on pedal-powered vehicles to travel long distances of track. The latest incarnation is sleeker, lighter, more reliable … and a helluva lot more fun. Go it alone, with someone you (mostly) like, or bring a total of four passengers on the company’s “Cadillac” edition Quad Explorer. ‘The Northern Ramble’: a six-mile exploration of the historic railroad between Portsmouth and the Sakonnet River. One way tour with shuttle bus. ‘The Southern Circuit’: a six-mile round trip tour (3 miles out, 3 miles back). Bring a drink or a snack to enjoy during a 30-minute break at Bayside Station, an exclusive waterfront picnic area, before riding back to the station. Newport’s mansions are some of the most famous “summer homes” in the country. A proper tour of the Breakers is practically required for first-time visitors, and it does provide plenty of historical perspective on the city’s history. But, the surrounding Ocean Drive is wrought with tourists, particularly during the summer. If you’re looking to sidestep the throngs of out-of-towners and take an exclusive mansion tour, you need to rise above the crowds — literally. The best way to do that? A proper helicopter tour with the aptly named Newport Helicopter Tours. The company offers a variety of options from the entry-level 12-minute tour for just USD $75 per person. But, if you’re willing to splurge, the 20-minute Sunset Island Tour is the way to go. The views are ridiculous. Or, if you’re feeling especially adventurous, take an Intro/Demo Flight where you can play helicopter pilot for almost a half-hour. It’s worth noting the company even offers discounted helicopter tour / rail biking combo packages. So, if you’re considering both, you can save quite a bit with just one booking. Of course, if parasailing and helicopter flights aren’t disco enough for you, skydiving is the only way to fly. Skydive Newport has been launching jumps out of South County since 1999. The company specializes in tandem skydiving, so they’re an obvious choice for first-timers. All-in rates start just north of USD $200 (with a discount for cash customers), plus a tip for your instructor. But … can you really put a price tag on sheer, unforgettable terror as you plummet to the earth at more than 100 miles per hour with a stranger strapped to your back? What are your favorite things to do in Newport? Share with us in the comments below! 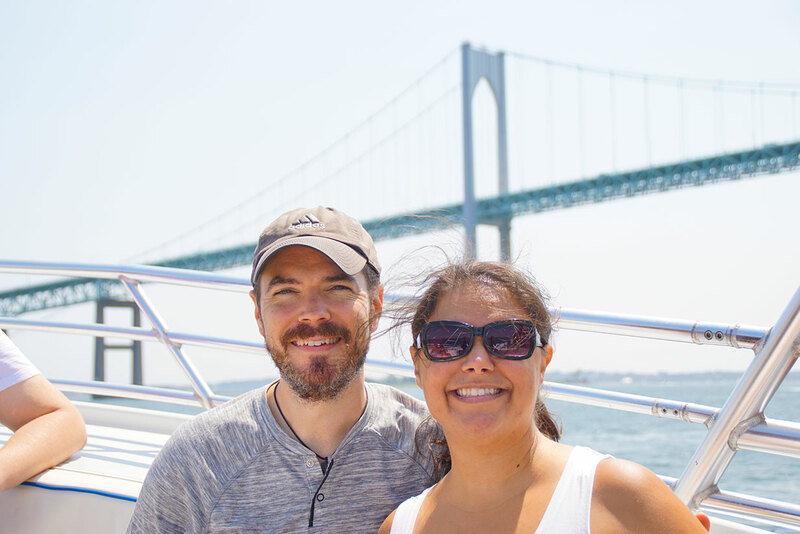 The post 4 Awesomely Adventurous Ways to See Newport, Rhode Island appeared first on Vagabondish.